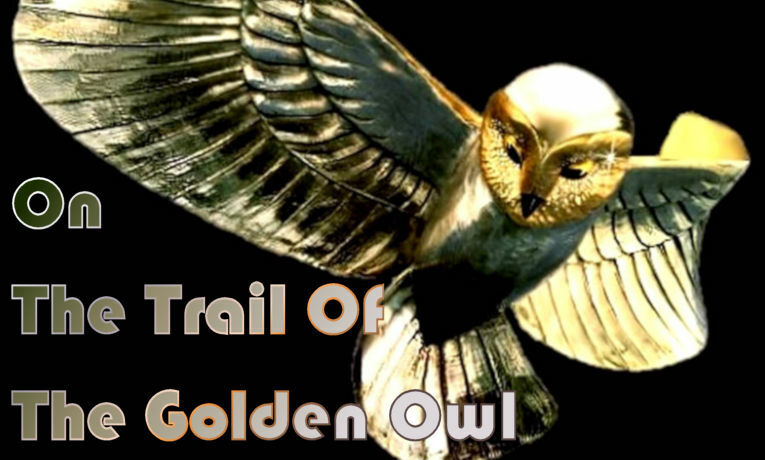 On The Trail Of The Golden Owl is an illustrated “armchair treasure hunt” book created by Max Valentin and artist Michel Becker, and published in 1993. Becker created the illustrations used in the book and the prize, a statuette of a gold owl. Actually the statuette is made of gold and silver, with diamonds on the head. It is 25 cm high, 50 cm wide, and weighs 15 kg. In 1993, the owl was estimated at 150,000 euros. The item that is buried is a bronze replica and was hidden somewhere in mainland France on the night of 23rd April 1993. It has never been found. Whomever does find the replica can bring it to the publisher to exchange it for the real thing. The book consists of eleven double-page spreads containing riddles that the reader needs to solve to find the next clue as to the location of the owl. Each spread has a title, text, and an illustration as part of the riddle. The spreads are numbered 500, 530, 780, 600, B, 420, 520, 650, 470, 560, and 580. Turn to page 2 to figure out in which order the spreads should be read. For those who are interested, the official “Owl hunters” website can be visited here: https://www.lachouette.net/ (note: in French! ).